YouTellMe - this App helps to communicate with a hearing disabled person. Type your message on the keyboard! 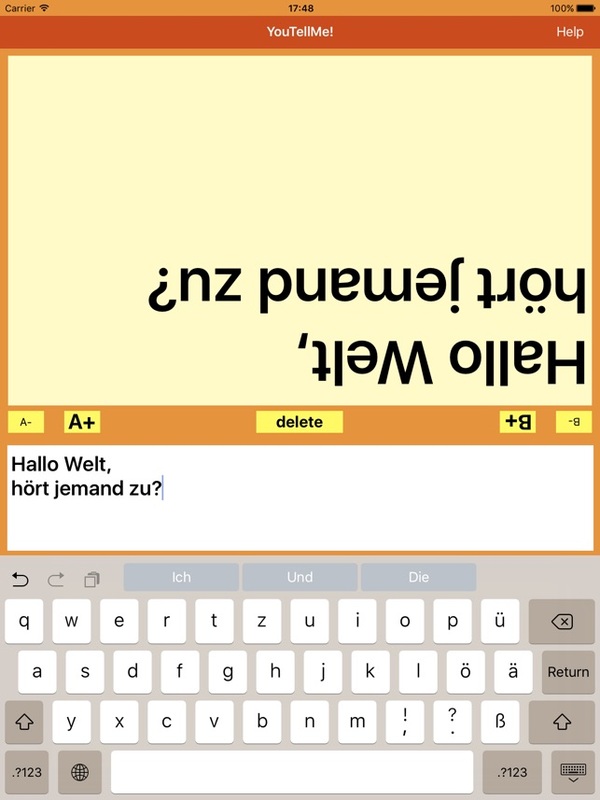 You can see your text above the keyboard - the other person, sitting opposite, can read your message in the yellow text field. If your iPad supports Siri, you can tap the microphone button on the keyboard and dictate your message. End dictation by tapping "done", then your message will be displayed. Text size can be adjusted independently in both text fields. YouTellMe! does not rotate when you rotate your iPad. This is to make sure the Person opposite can always see the big Text. YouTellMe is also useful for people who are not able to talk, for instance due to tracheostomy. Version 1.3: internal updates to keep up with iOS updates. I am an SLP who uses this app when treating patients who are hard of hearing. This app is fabulous! It makes sessions run more smoothly since I was writing everything down on a white board before. The font size can be adjusted, and if your device is enabled to use a microphone you can use dictation as well. This makes a big difference in treatment sessions! Thank you so much!